Fujitsu SP-1120 Scanner Driver. I used the iX500 from Fujitsu at work and ordered this new Fujitsu SP-1120, cheaper version for the home after the positive experiences. First of all: One should take a lot of time for the installation. The crude collection of written software would like to update for hours on the Internet, the same applies to the scanner software. Since it is only then possible to determine which of the software you actually need or need, this initially costs a lot of nerves. 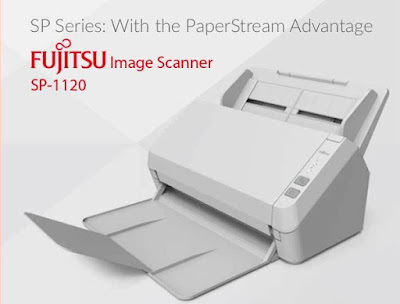 The Fujitsu SP-1120 scanner itself can be commissioned in 15 minutes, pull off protective strips, fold out, connect power, then start driver installation from the CD and only then plug in. If you have a flatbed scanner in operation as with me, you should get used to frequent resetting of the second scanner. The processing on the SP-1120 looks like you've just dropped everything from the more luxurious iX500 that does not have to. The scan data are identical. The scanner feeds up to 50 pages reliably on both sides and if the software does not slow down, which it likes to do also scans it in color at 20 pages per minute. It can not fold as elegant as his big brother and does not look quite so pretty, but tortzdem needs only a very small footprint. The software is good, but for the actual driver quite little. The Fujitsu SP-1120 driver is annoying with it (where do you do that? ), That unlike the iX500 it always opens a window in which you have to confirm that the document is really over. That may be nice, if you scan 2000 pages at a time, for the daily operation that is just a click too much. You wait in the program that the pages are displayed and nothing happens. The ScanSnap Manager and Organizer on the iX500 is worlds better. A supplied software even slows down the scanner AND it makes noticeable pauses between the pages (computer Windows 7 64 bit, 16 GB RAM, SSD, i5 3.3 GHz), because the software does not process so fast. All other included products are among my clicky-bunty software and will soon disappear from my hard drive. I use the scanner now with Adobe DC 17, because IT works very well and will probably even try if IT does not work with the very sophisticated software for the iX500. Conclusion: If one does not bother the optics and you already have a proven scan software anyway, you can safely buy the SP-1120 at half the price of the iX500 in my view. For all others, you should add in the price of software intended for the purpose, unless you are really very capable of suffering.